You know what I love about pop-up books? All that 3-D awesomeness. Kids love that. Of course, with a rough-and-tumble boy child, they barely last through a few readings before they end up ripped and eventually, destroyed. Which is why a tweet by @pfromthev caught my attention a few weeks ago. He mentioned a site called Zooburst a tool to create online 3-D pop-up books. How does that work, exactly on my 2-d screen? Well, they're quite ingeniously designed, with the book appearing to be lying in front of you and the animations "popped out" above the book. (See image). If you have a webcam, you can actually interact with the site and get a richer book experience -- even the ability to see the book from all sides. 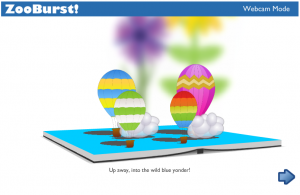 The tool enables users to create their own Flash pop-up books and then share them via the Zooburst site. Some of the books can be pretty slow-loading, in fact I couldn't get the Red Riding one on the homepage to load in any of my browsers - they all crashed. But the overall effect (for the ones that work) is pretty kewl. There are new books being added all the time, and no destruction! I think this site is a great way to engage kids online. The Dude isn't allowed to spend much time on the computer (he'll get addicted eventually, I'm sure; for now, he spends most of his time offline). We tend to bribe him for his few monthly hours by encouraging him to visit sites that have reading or math exercises in addition to gaming over at Lego and Teletoon. Something like Zooburst would be an easy sell since he could read to us out loud and get to see something visually engaging on-screen at the same time. Do you know of anything similar? What other educational/reading sites do your kids use (without knowing ;)? Leave a comment!